Cheerleading requires shoulder strength, arm strength and back strength in order to perform great jumps and stunts. The Myosource Kinetic Bands / Cheer Jump Bands upper body kit is great for toning and firming the arms, shoulders and back muscles. Four levels of resistance offers options to train for a beginner, intermediate, advanced or power level cheerleader. The 4 levels of resistance can be used individually, or more than one at a time as cheerleaders advance. Upper body strength is essential for all cheerleaders in order to perform stunts and jumps. Cheerleaders also need upper body strength for tumbling, lifting, and balancing. Fliers: Cheerleading Fliers have to tighten their muscles while being lifted into the air. If their body does not remain tight it is hard to balance and remain in the proper position. Bases: Cheerleading Bases have to utilize their upper body strength in order to lift their flier up over their head and to hold their flier in position throughout each stunt. Myosource Upper Body Workout Bands / Cheer Bands allow cheerleaders to use their own body weight through resistance to put tension on their muscles in building upper body muscle strength, power, elasticity, and flexibility. The bands are easy to use, compact, and inexpensive. This allows cheerleaders to train anytime and anywhere. Adding resistance to workouts will increase muscle tone. The bands work the arms, shoulders, chest, and back. Many cheerleaders are using the upper body bands along with the lower body bands for a full body workout. Performing simple upper body exercises with the upper body bands, such as pushups, is very effective way to increase upper body strength. There are a variety of exercises and combinations of exercises cheerleaders can do using the upper body bands: biceps curls, triceps extensions, rowing, side/overhead/front/back presses, and kickbacks are a few of them. The four levels of resistance allows each cheerleader the ability to train and increase their resistance as they advance. 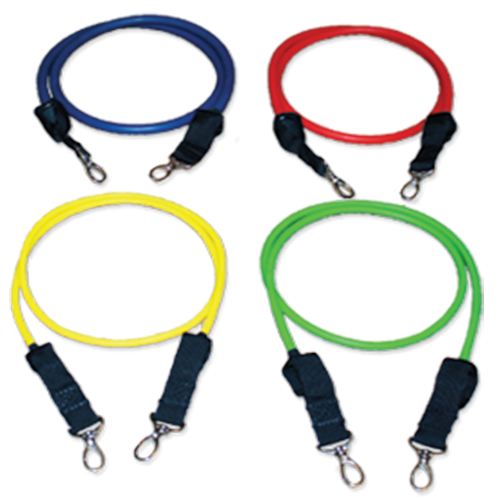 Each set includes two handles, four long resistance bands of varying resistance, over the door attachment, two ankle straps, and a handy travel bag. Each resistance band can be used individually or together in many combinations to provide the right resistance level you need to meet your training goals. KB Upper Body Workout Bands are the complete package for cheerleaders who desire to strengthen their upper body. This set will allow you to add one or up to four levels of resistance bands to your handles. Even the elite cheerleaders will be challenged. Mix and Max the levels of resistance at your own pace. If you need additional resistance extra bands can be purchases at minimal cost.